Lennie High graduated from Bement High School in 1914 in a senior class of 15 students. While there he excelled in football, basketball, and track. He also appeared in the school play The Merchant of Venice, was an officer in the literary society and debated in a school fundraiser – “Resolved that football is conducive to good manhood.” He entered Eastern Illinois State Normal School sometime during the 1914-1915 school year when tuition was free to those who planned to teach in the public schools of Illinois. He was on the baseball team in 1915 and was a halfback on the Panthers football team that fall which played the first Homecoming game at EIU. In September of 1916, he became a teacher at a small school in rural Piatt County. That October the Decatur Herald reported that High would be joining future Staley teammates Jack Mintun and Charlie Dressen in playing on the independent “Decatur Indians” football team. The paper exclaimed that “He was a star on the Charleston State Normal team for two years.” The following summer he was working as a farm hand when he registered for the draft. With the war in full swing, Lennie enlisted in the Reserve Officer Training Corps on December 14, 1917, and reported to Urbana on February 15, 1918, for ground training before being sent to Love Field in Dallas. That June he competed in a statewide track meet open to all cadets and officers in Texas. He won first place in the discus, third in the 100-yard dash and tied for first in the pole vault. High told his family that he was made a flight instructor in the new Army Air Corps but kept in Texas so that he could continue to compete for the base in track and field meets. His teammate from Love Field was Ohio State football phenom Chic Harley who won none of the events in that first meet. 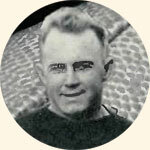 Harley would play football for the Staleys in 1921. 2nd Lieutenant High was released from the army on January 11, 1919, and did farm work and taught near Bement for the next year. He soon took a job in the syrup house at the A.E. Staley factory. In September 1920 Lennie tried out for the football team and was right in the middle of the famous Staley team photo. In the opening game on October 3 against the Moline Tractors in front of 2,000 fans at Staley field, Lennie was called in to substitute for George Halas at right end. For whatever reason, the 25-year-old High never played in another Staley game, and there is no record of him receiving a player bonus. In a Decatur newspaper interview a few days before the 1956 team reunion, Lennie admitted that he didn’t set any scoring records and estimated he used to play about half of the game. “It was quite a job to relieve Halas” he recalled. Because he never appeared in an APFA game in 1920, he is not listed as an official NFL player. However, he was warmly greeted by George Halas at the 1956 reunion in Chicago as one of the original Chicago Bears. Lennie married Monticello native Pauline Francis Dresback on March 31, 1921, and their only child, Jane Elnore was born later that year on October 15. The family lived in Champaign where Lennie and younger brother John were plumbers while older brother Gerald served as the city plumbing inspector. After Gerald died and the Great Depression started Lennie become a federal agent. On February 7, 1933, just ten months before prohibition ended, the local paper reported that investigator High had helped break up a suspected speakeasy along Lake Decatur. After prohibition ended, so did his federal job. By 1937 Lennie moved the family to California where he worked as a payroll guard for a power company and then as a plumber for the city. As military tensions between the U.S. and Japan increased, High worked installing plumbing at new military bases throughout California. In 1941 he was sent as a civilian contractor to Wake Island in the western Pacific Ocean to install plumbing at the U.S. military base. On December 11, U.S. Marines, sailors, and civilians on Wake Island repulsed the first wave of Japanese attackers but could not withstand the carrier-supported second attack on December 23. By Christmas, Lennie High was taken prisoner and soon sent to a POW camp in China. According to family members, Lennie nearly starved while a prisoner as his weight dropped close to 100 pounds. After two years in China, he was transferred to a POW installation at the Japanese port of Kobe where he was made to serve as a welder’s helper in the shipyard. When Japan surrendered in August 1945 High was liberated and first sent to the Philippines and then returned to the U.S. with a ship full of international POWs in October. He eventually became a building and safety inspector for the city of Los Angeles before retiring to Whittier. Lennie High passed away on November 16, 1975, in the hospital in Whittier. He rests in the Monticello Township Cemetery in Piatt County next to his wife Pauline who passed in 1982.